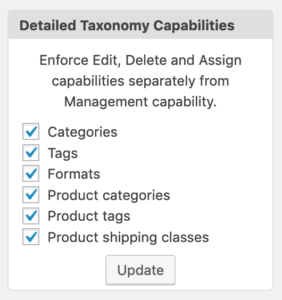 Capability Manager Enhanced is one of the most popular permissions plugins for WordPress. We acquired the plugin in February and are working hard on improvements. Our goal is to create a suite of powerful publishing plugins for WordPress. Capability Manager Enhanced is key to that goal. Version 1.7 of Capability Manager Enhanced is available and it adds many new permissions features. This is a WordPress permission that we covered in detail in this blog post. By default, the “Edit” permission in WordPress covers both editing and creating. But what happens if you want some users to edit posts, but not create them? That’s where the “create_posts” permission is useful. 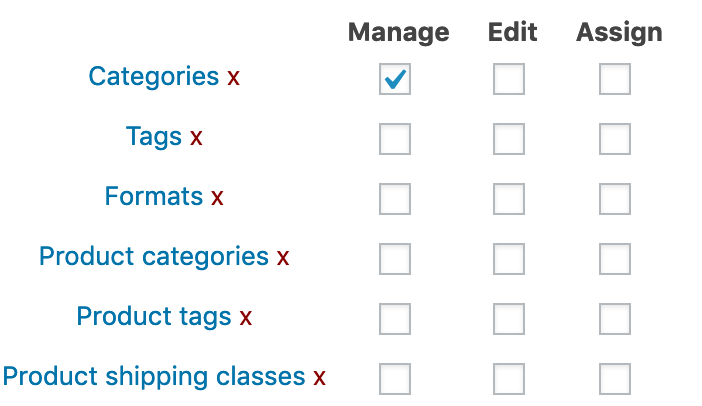 If you check the “Use create_posts capability” box, you will see a new “Create” column for post types. You can now apply “Edit” and “Create” permissions separately. 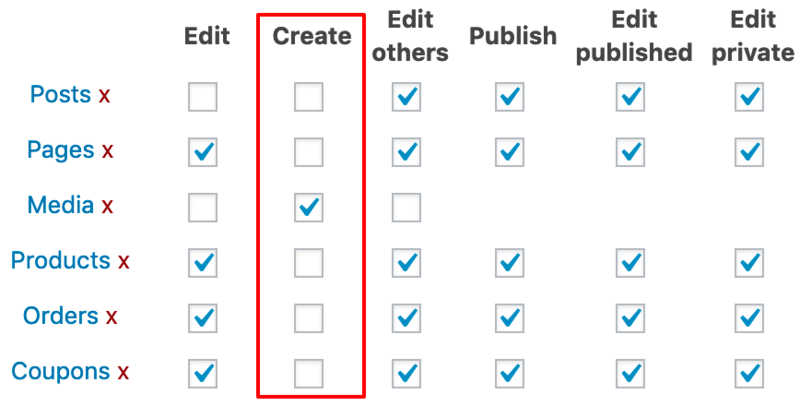 When a new post type is registered on your site, WordPress automatically sets the permissions. Those permissions are borrowed from Posts and Pages capabilities. This allows Authors and Editors access to the new post type without any further configuration. For most use cases, this is a good choice. However, it limits the site Administrator’s flexibility in customizing access. 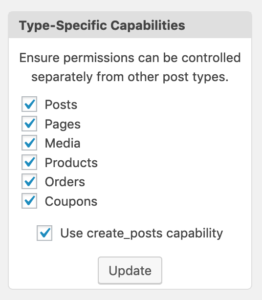 Some custom post types defined by third party code or CPT management plugins will include unique capability definitions and automatically assign those to certain roles. But even then, some of the capabilities may still be shared with another post type. For Administrators desiring finer control, Capability Manager now provides a way to ensure that each capability defined for a post type can be uniquely granted or removed from any role. 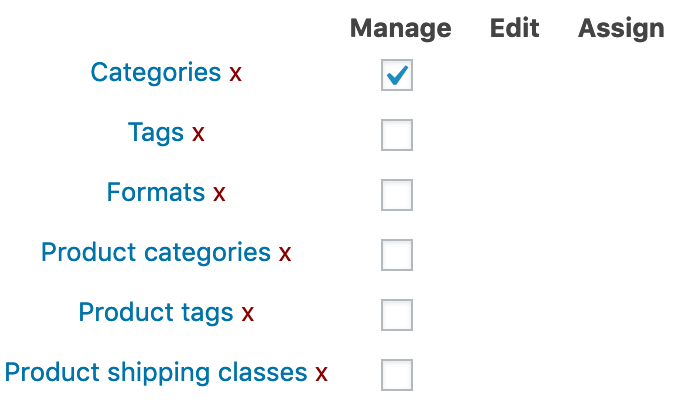 To enable this feature for a post type, select it in the “Type-Specific Capabilities” checklist. Be aware that this will trigger new capability requirements for the selected post types. After enabling, you should review each role’s Edit, Create and Delete checkbox areas, assigning the newly activated capabilities where needed. 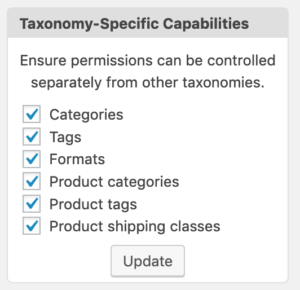 You will now see that you can give “Manage”, “Edit” and “Assign” permissions for all your taxonomies. Click here for a detailed guide to WooCommerce order permissions. If you haven’t tried it yet, please download and try the Capability Manager Enhanced plugin. With over 70,000 active installs, it’s already one of the most popular permissions plugins for WordPress. Our aim is to also make sure it’s one of the best. If you have any suggestions for improvements, we’d love to hear from you: help@publishpress.com.